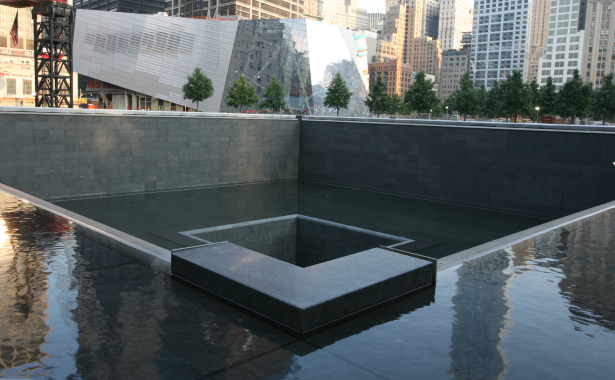 National September 11 Memorial And Museum: The official web-site for the New York memorial. "9/11: Ten Years," New Yorker, (September 9, 2011). Times Topics -- 9/11 Memorial And Memorial Museum: Articles from the archives of the New York Times. Times Topics -- 9/11 Reconstruction: Articles from the archives of the New York Times. Edward Rothstein, "A Memorial To Personal Memory," New York Times, May 22, 2014. "World Trade Center Rising From The Ashes Of Ground Zero," BBC News, September 10, 2010. Nicolai Ouroussoff, "A Tower that Sends A Message Of Anxiety, Not Ambition," New York Times, February 19, 2007. What would be the most appropriate memorial for the World Trade Center site and why? What controversies have been associated with the issues both of how to memorialize September 11, 2001 and of what to build at "Ground Zero?" How have Americans remembered September 11, 2001? Is there an "official" American narrative about September 11 or are the divisions within American society significant enough that such a narrative has not been accepted? What are the counter-narratives, both within the United States and internationally? How have different individuals used the memories of September 11 to interpret the world and/or to support their own agendas? What is most interesting about the language and symbols used in relationship to September 11, 2001, and how, if at all, has this had an impact upon collective memory? Assess the following terms: 1) "Ground Zero"; 2) "9/11"; 3) "War on Terror." How would you relate the issue of family/private grief to questions connected to the public commemoration of September 11? What role have families played in shaping public memory? Where would you fit Shanksville, Pennsylvania and the Pentagon Attack into your analysis of the memorialization process? To what extent have you struggled to make sense of September 11, 2001 memories? How has your understanding of those memories changed? What is the story/stories? What else would you highlight in linking the theme of war and memory to the events of September 11, 2001?